First Look at Will Smith as Disney's Aladdin Genie | Nerd Much? Back in October, Disney offered us a glimpse of their upcoming live-action Aladdin remake with the film’s first teaser trailer. It didn’t show much, and fans walked away disappointed when Will Smith’s take on the franchise’s iconic Genie was held back. The House of Mouse is finally ready to show more though, as EW has dropped a handful of images which includes our first look as Will Smith as Disney’s Aladdin Genie. The first image shared is a one on one conversation between Aladdin (Mena Massoud) and the newly released Genie (Smith). 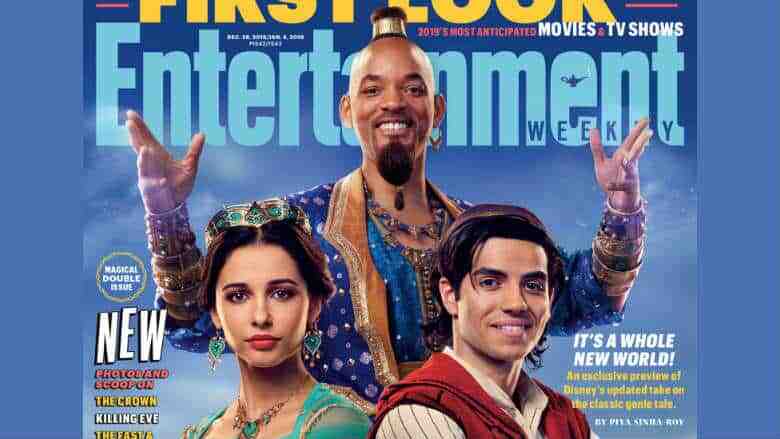 Outside of the cover of this edition of Entertainment Weekly, it’s the only image we get to see of Will Smith portraying Disney’s Aladdin Genie. There’s a good bit of Princess Jasmine on display in the photo gallery. She’s dressed stealthily as she traverses the streets of Agrabah in one image. And in other we’re introduced to her close friend and handmaiden, Dalia, played by Nasim Pedrad. Dalia is assisting the Princess in choosing who to elect as a worthy suitor. Aladdin, of course, gets some camera time as well. There’s a shot of the hero defending children from attackers on the streets of Agrabah. And other with him accompanying Princess Jasmine as the duo attempt to flee from pursing palace guards. We also get our first look at Marwan Kenzari as the infamous Jafar. The villain is holding the lamp that houses the Genie, surely plotting a way to steal the throne for himself. And last, but certainly not least, we finally get to a peek of Aladdin’s beloved sidekick, Abu. The monkey stares in awe as he and Aladdin discover what’s inside the Cave of Wonders. EW also confirms that even though she isn’t present, Rajah will have a role to play in the upcoming movie as well. We should get to see Will Smith as Disney’s Aladdin Genie within a trailer at some point in the near future. The movie isn’t far off, it’s arriving in theaters May 24th.